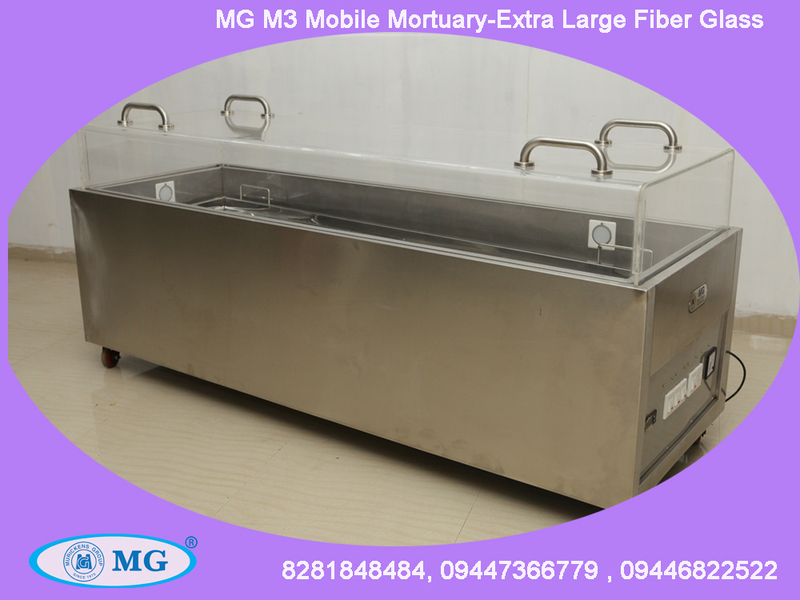 Murickens group are the first manufacturer of mobile mortuary freezer in India. We have two types of dead body freezer box . The difference is in size and material of top cover. First standard export model MG- M1 - is “U" shaped single Curved Acrylic glass with 12 mm thickness or with pure glass top of model -MG-M2 . second one is EL - ( extra large ) with Acrylic glass top , model MG-M3. or pure glass top model MG-M4. Acrylic glass top (Fibber) is the most suitable one. It holds more cooling effect and light weight and unbreakable . MG mobile mortuary top cover is made up of single glass, hence we can view the entire body from different angles. Body of MG freezer is made fully of stainless steel and copper. By using imported compressor it saves power and assures long life performance. MG mobile mortuary is one of the most popular products in India with ISO certificate. ► US Technology with low maintenance. ► Dead body can be preserved for longer periods. ► Stainless Steel stretcher. ► Mortuary body made-up of full pure Stainless steel and copper which provide complaint free working and long life. ► View from all angles. ► Fully automatic ► Separate on-off switch for voltmeter ,lights and compressor. ► Full PUF system (New technology). ► Inner side light. ► Top door opening with side view Acrylic glass (Fiberglass) /Pure Glass ( optional ).►Attractive top door handle 4 No. ► Light weight and compact size. ► Noiseless functioning. ► Wheel mounted (smooth and strong four wheels). ► Attractive look and long durability. ► Adjustable Digital display thermo meter.►Input voltmeter. Temperature from -2oC to -20oC.